Puerto Rico lay to the east of Hispaniola, part of the Greater Antilles chain. Its pre-Columbian history is very vague but archaeological evidence states that it was first occupied by the Ortoiroid people who probably originated in the Orinoco Valley in South America before 5230 BC. They migrated into the Antilles, where their last traces date to AD 190. The Taino people became dominant in the region by the eleventh century AD. The Spanish explorer Juan Ponce de Leon, was the first European to reach Florida. He also served in Spanish wars against the Moors of Granada, and in 1493 he accompanied Columbus on his second voyage to America. 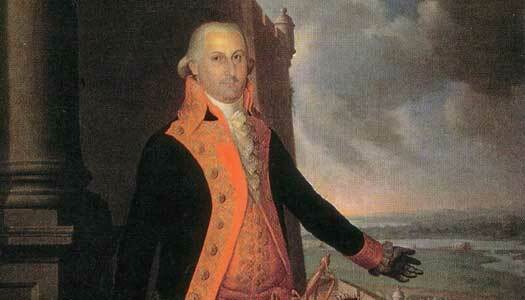 After helping to conquer Higuey on eastern Hispaniola he was made governor of that region. He was then sent out to conquer the island of Boriken or Boriquen (Puerto Rico) in 1508 after finding gold there. As the first governor of the island he made a fortune in gold, slaves and land. The Ortoiroid people migrate into the Greater Antilles chain of islands. The Ortoiroid people are replaced by the Saladoid, another tribe from the Orinoco Valley. The Saladoid people are replaced by the Igneri, yet another tribe from the Orinoco Valley. The seafaring Taino people, a division of the Arawak group of American natives, probably arrive on the island around this date, mixing with the Igneri. The viceroy of Hispaniola, Christopher Columbus, lands in Puerto Rico on his second voyage from Spain, making landfall on 19 November. He names the island San Juan Bautista (St John the Baptist). While this name is later retained for the capital, the island is renamed Rich Port (Puerto Rico) by the time a member of the expedition, Juan Ponce de Leon, becomes its first governor. Failed to take up his office. Following his arrival in the Americas in 1493 and a possible return to Spain, in 1504 Juan Ponce de Leon is made governor of part of eastern Hispaniola. Between 1506-1508, lured by reports of fertile land and rivers of gold, he explores Puerto Rico and is made its first governor to take up the post by the Spanish crown. Supreme Taino chief and friendly to Spain. First Spanish governor of Puerto Rico. Later of Florida. 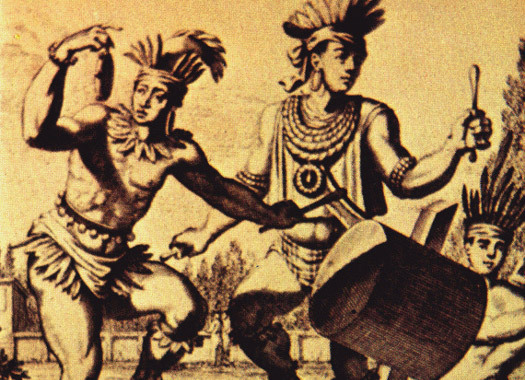 Harsh treatment and diseases introduced by the Europeans have made life for the native Taino unbearable enough so that a short-lived rebellion is staged in June 1511. It is put down with force by the governor. In the same year, Ponce de Leon is urged by the king of Spain to investigate rumours of undiscovered lands to the north of Hispaniola. The crown is eager to keep out Diego Columbus, the unwanted viceroy of Hispaniola, and reward Ponce de Leon for his efforts. Brother of Agueybana and leader of the rebellion against Spain. The expedition to the north under Juan Ponce de Leon gets underway on 4 March. On 2 April land is sighted which is named Florida. Eventually they make landfall on the western coast, probably in the vicinity of Charlotte Harbour or Tampa Bay. After returning briefly to Puerto Rico and then Spain, Ponce de Leon is confirmed as governor of Florida. Second term. Also governor of Florida (1514-1521). The town of San German, in the south-west of the island, is sacked and burned by the French as part of their efforts to dislodge the Spanish from the strategically important location. Several more towns are subsequently attacked. Second term. Also governor of Panama. Construction of fully-fledged fortifications around San Juan begin. Three major forts are included in the plans of construction for the defences, but San German on the opposite side of the island remains undefended. Acting governor and first native to hold the post. Puerto Rico is reorganised into a more autonomous captaincy general. In 1580, Puerto Rico became a captaincy general, headed for the most part by military figures. The move proved to be necessary due to the increased threat of piracy from the Caribbean, and the hope was that granting Puerto Rico administrative and military autonomy would effectively counter that threat, especially as Spain viewed it as the 'key to the Indies'. Ultimately, the changes failed to have a lasting effect. As part of the Anglo-Spanish War, English forces under Francis Drake and the earl of Cumberland attack and seize the island, holding it for several months until dysentery forces a withdrawal. The Spanish reoccupy and reinforce the island. Dutch forces under Boudewijn Hendrick attack San Juan, but are forced back by Juan de Haro, although they set fire to the city as they retreat. A minor attack by the English on the town of Arecibo is unsuccessful. Second term as acting governor. Third term as acting governor (Mar-Nov). As part of the Napoleonic Wars, France and Spain declare war on Britain, so a British force of 7,000 troops and sixty-four ships under General Ralph Abercromby invades Puerto Rico, attempting to conquer the strategically important island. The captain general leads his forces in a successful defence. In 1820, a restoration of the Spanish Constitution of 1812 is achieved in Cuba, but the following year Spain loses vast sections of New Spain to revolution and newly independent states. Puerto Rico remains loyal. Between 24 September until October the island is gripped by the Lares Rebellion, which declares Puerto Rico to be a republic. The rebellion is quickly suppressed. President Buenaventura Baez of the Dominican Republic is deposed in yet another coup in the country and this time he is exiled to Puerto Rico where he lives out his few remaining years. Second term as acting governor (Nov only). In 1896-1897, autonomy was granted to the island in order to satisfy demands for greater freedom. This involved the establishment of local government and parliament which was headed by a governor general. Unfortunately the move was too late, and the changes lasted less than two years before Spain lost all control of its territories in the Americas. Second term as acting governor (Jan-Feb). Third term as acting governor (14-18 Oct only). 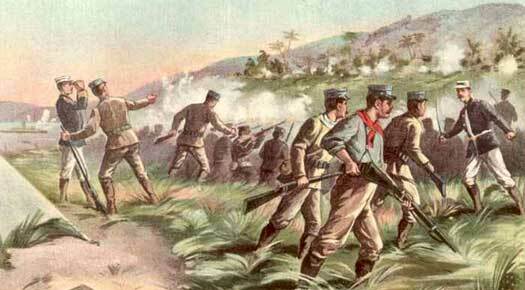 Following a US invasion of Puerto Rico, Spain loses the Spanish-American War. With that it also loses much of the Spanish Caribbean, including Cuba, Puerto Rico, and the Spanish East Indies (including Guam, the Marianna Islands, and the Philippines). Puerto Rico becomes an unincorporated territory of the USA. Together with Cuba, Jamaica, Haiti, and the Dominican Republic, the island of Puerto Rico and several smaller islands which surround it form part of the Greater Antilles chain in the Caribbean. 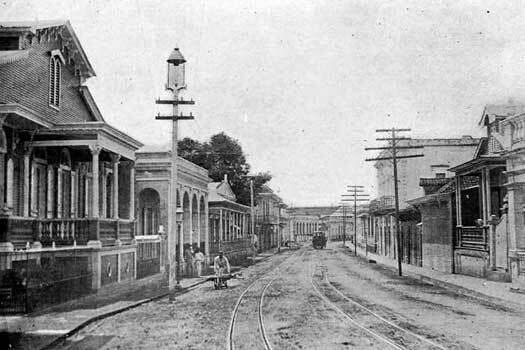 The capital is located at San Juan, which was founded by Spanish settlers in 1521. The country is neighboured by the British Virgin Islands, the Lesser Antilles, and the Atlantic Ocean to the east, and by the Dominican Republic to the west. The Caribbean Sea divides it from Venezuela to the south. The modern state is called the Commonwealth of Puerto Rico, a self governing entity which is an unincorporated territory of the USA. The term 'territory' was used to describe thirty-one areas of North America which applied to become states between 1789-1959, such as Florida and Louisiana. Since 1898 and the Spanish-American War, the US has also administered unincorporated territories, these being overseas possessions which are under US jurisdiction but to which only selected parts of the US constitution are applied. The local name which is sometimes applied to the island, Borinquen, originates from the native Taino name of Boriken. When originally conquered from Spain by the USA in the 1898 war, the US appointed its own governors to administer the island under military rule until 1935. From 1900, the Foraker Act allotted Puerto Rico with some of the elements of democratic government. First of several US military governors. After being administered by US military governors for two years, the Foraker Act gives Puerto Rico some of the elements of democratic government, including a US-style House of Representatives. The judicial effect also follows US practice. The House of Delegates votes unanimously in favour of independence from the USA, but this is rejected by the US Congress as being unconstitutional and in violation of the Foraker Act of 1900. Puerto Rico plays its own role as an ally of the USA during the First World War against Germany and the Austro-Hungarian empire. Also in 1917, the country's populace gain US citizenship under the Jones-Shafroth Act. Son of US President Roosevelt. In the past few years several calls have been made in support of independence from the USA. Now the political party of Albizu Campos organised a protest in which numerous people in Ponce are killed by police. The country's 'Insular Police', a form of reservist army, opens fire on cadets and bystanders alike, despite their being unarmed. The attack is investigated by the US Hays Commission and is declared to be a massacre and 'police mob action' (it becomes known to history as the Ponce Massacre). Second term as acting governor (Jul-Sep). Puerto Rico joins the Second World War in association with the USA and as an ally of Great Britain on 8 December 1941, against Japan, Germany and Italy. In the aftermath of the Ponce Massacre, a bill is introduced to the US Congress on 2 April 1943 calling for independence for Puerto Rico. Ultimately the bill is defeated. The US grants Puerto Ricans the right to democratically elect their own governor, which they do so the following year. Luis Munoz Marin is the first victorious incumbent. First democratically-elected Puerto Rican governor. Demands for change by the Puerto Rican Nationalist Party result in a three-day revolt known as the Jayuya Uprising which begins on 30 October. Martial law is declared by the US authorities and the military is sent in to pacify the town. At the end of the revolt, two nationalists attempt to assassinate the US president, Harry Truman. One is killed, the other is taken alive. Following a request by the USA, a local constitution is approved for Puerto Rico on 25 July.